We're trying to get little moon to eat solids more regularly, so we've been looking for a high chair for the longest time. Mealtimes used to mean playpen time for her so I could enjoy a decent meal. She wasn't very interested in real food - a few nibbles here and there, and that's lunch. But that had to change, and getting her her own chair is one step towards that. These modern designer chairs look lovely. But the price tags don't, so these weren't on our list. No way am I spending over 10k for something that Ally will outgrow in a year, or even sooner. But let's just drool over these pretties for a bit, shall we? 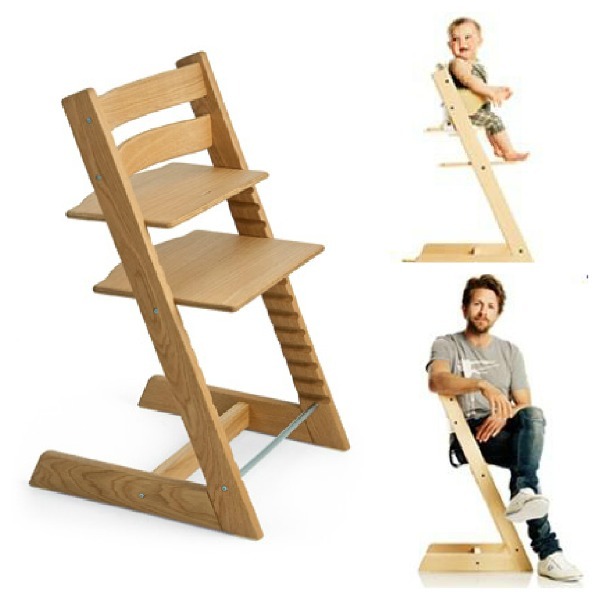 I love the Stokke Tripp Trapp designed by Peter Opsvik. The non-cutesy, no-frills design will blend well with your interiors. It was designed to grow with your child, as you can see in the photo. Peter Opsvik's idea was to create a chair that could seat people of all sizes and ages. 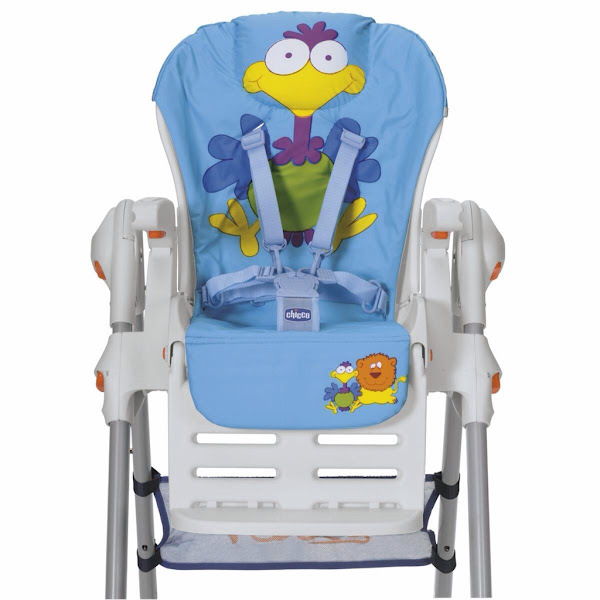 The steps are adjustable, and there are accessories (like an attachment for younger babies) that you can purchase separately. It looks easy enough to clean. I'm not too sure about comfort though. If the hefty price tag isn't an issue (a whopping Php15,395), you can get your Stokke Tripp Trapp from Mothercare Philippines. It comes in gorgeous red and other yummy colors. And how about this space-age seater? 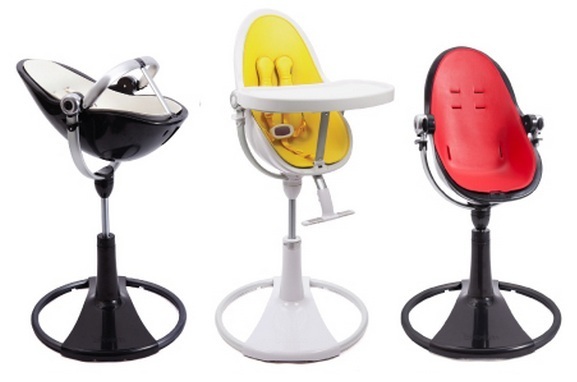 Fresco's Bloom high chair is very mid century modern - reminds me of Eero Saarinen's iconic Tulip chair. I want it. But it's $450. If you've got the cash to burn, get it locally from Hobbes and Landes. Now on to the more realistic stuff. 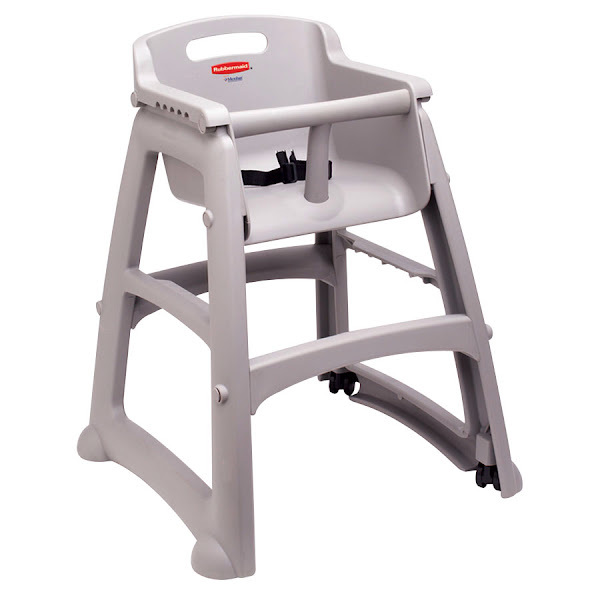 This utilitarian Rubbermaid high chair is far from designer. This was on our list. You're probably familiar with it, they're usually used in fast food restos. We figured we wanted something simple and easy to clean, and it looked like Ally didn't mind sitting in it when we eat at Jollibee. But we realized the Rubbermaid chair is only ideal for quick fast food meals. It isn't comfortable for longer, proper meals at home. This is what we finally decided to get for Ally. 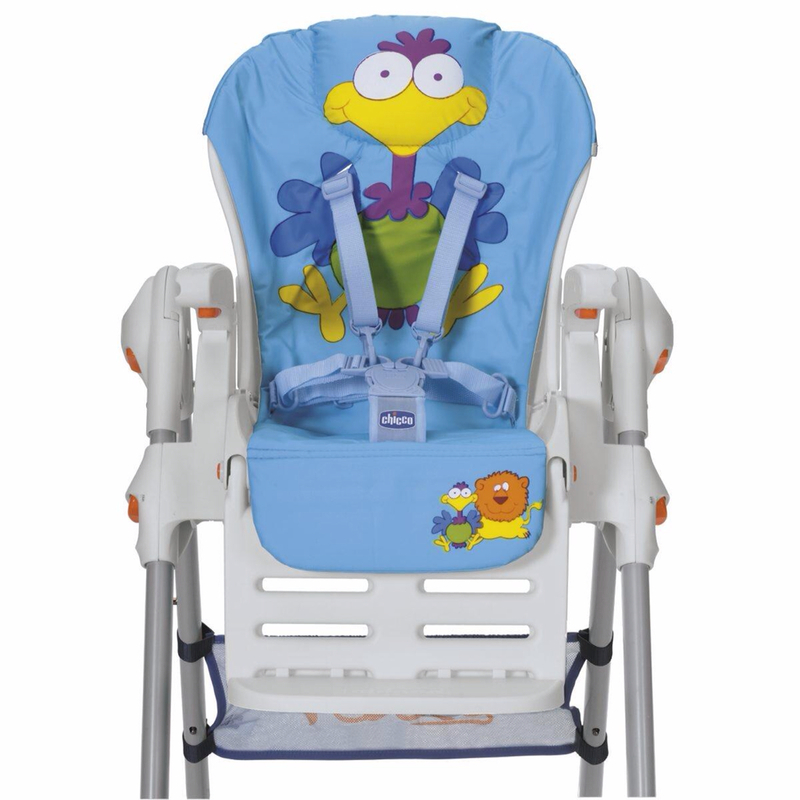 The Chicco Polly 2-in-1 is as different from the Stokke and Bloom as one can get. I wasn't too keen on the cartoon character illustrations, although I like that it's blue. But little moon loved it, and that's all that mattered. She finds those huge googly eyes funny, and enjoys sitting in her new chair because it feels like play time! This will make meal times enjoyable and not feel like a chore for her. It's easy to clean too - the tray has a liner you can remove (the blue thing you can see in the picture). The double cushions are easy to wipe clean. They're detachable, which is a good thing because the folds in the cushions are a magnet for crumbs. So every after meals, we take out the top cushion and shake off the tiny bits of food. There are a number of adjustments you can make. The seat reclines, the tray is fully detachable, the arm rests fold up. 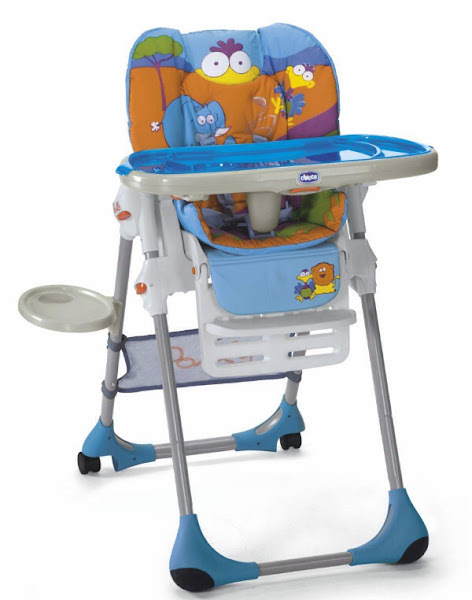 The height is also adjustable - you can turn it into a low chair so baby can eat with you at the table. The chair folds up for easy storage, but it's not the most compact thing out there. So if space is an issue (it's not for us), this isn't the chair to get. But the best thing about this is the 5-point harness - very safe for my very malikot, wriggly toddler. Ally loves it so much, it's growing on me. Thanks to the double cushions, it's very comfortable - and that matters a lot. Meal times for her are now almost 2 hours long. I discovered she's a grazer - she won't thrive when you shove spoonfuls of food in her mouth. So I set different food in front of her - cheese, slices of orange, cereal, baby biscuits - and let her eat at her own pace. She wants to do her own thing, even insists on using a spoon! It's so adorable how she tries to scoop up food with her little pink plastic spoon. 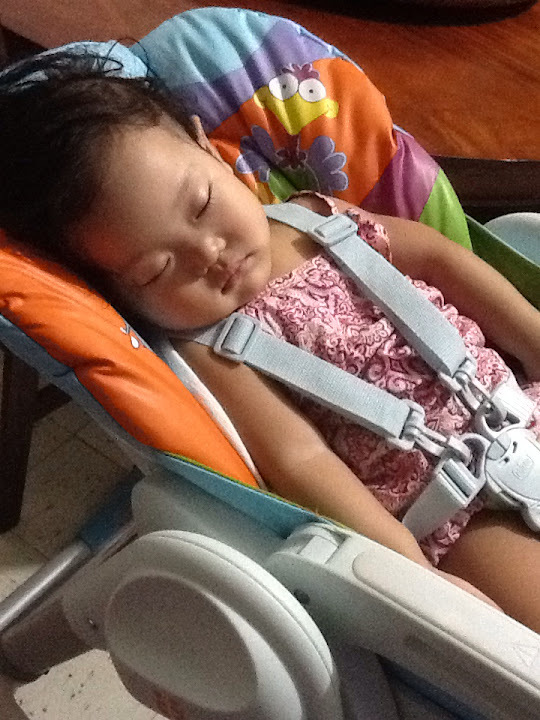 You want to know how comfortable the new high chair is? See for yourself.